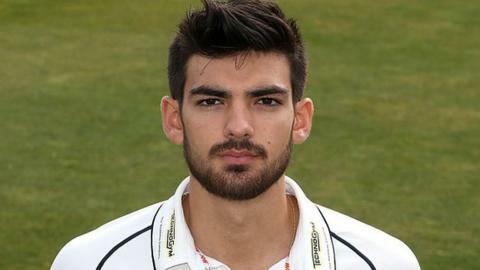 Warwickshire youngster Andy Umeed made a maiden century on his Championship debut against Durham at Edgbaston. The 20-year-old Glaswegian hit 101 as the Bears reached 273-8 on a day reduced by rain to 77 overs. After putting on 120 for the first wicket with Varun Chopra (71), Umeed then put on a further 75 with returning captain Ian Bell (38). But the tail failed for once, seven wickets going for 64, including Umeed (101) as James Weighell took 4-75. Umeed came in for former captain Ian Westwood who had scored just 15 runs in five Championship matches this season. He was one of three changes made by the Bears with the fit-again Bell returning and Olly Hannon-Halby coming in for Rikki Clarke. Playing only his second first-class match, he survived a slip chance put down by Paul Collingwood . But he still featured in the Bears' first century opening stand since April 2014 with Chopra who maintained his good early season form. Prior to this game, since being promoted back to Division One for the 2009 season, this is the Bears' 117th Championship game. Discounting four matches in which rain prevented the first innings coming to a conclusion, over this period, on 48% of occasions, Warwickshire have scored more runs in the first innings after the fall of the fifth wicket than before it. "It doesn't get much better than that really, a debut hundred. I knew yesterday morning that I was playing. I was actually on my way back up to Scotland when I got a call to say I was in the squad. "It was great to open with Varun Chopra. He has got such a cool, calm head and makes it look so easy. I was definitely nervous in the nineties because you're thinking 'Come on, you've got this far'. Thankfully I got over the line. I just wish I could have kicked on and been not out overnight." "It's never good having a break for rain but it worked in our favour. It kept all our bowlers fresh and we came back a lot harder later on after a poorish start. "The ball was swinging from the start and kept swinging right until the close so, although as a bowler it's never good to look up and see 190 for one on the board, we always felt we were in the game. "It is always good to take wickets so I'm very happy to get four. Hopefully I can complete the five-for."